Due to rising costs and reduced public sector investment we will be revising the prices of our single, return, day and season tickets by an average of 4.2%. The good news is we have held the prices of some of our most popular tickets with no price change for the Family Explorer (£15.00), Torbay 4 week Megarider (£65.00) and Torbay 13 week Megarider (£200.00). Recognising the continued expansion of the Exeter city area we are also introducing two new tickets: the Exeter Dayrider Plus and Exeter Megarider Plus which will cover areas including Cranbrook, Rockbeare, Stoke Canon, Kennford, Exminster and Woodbury. 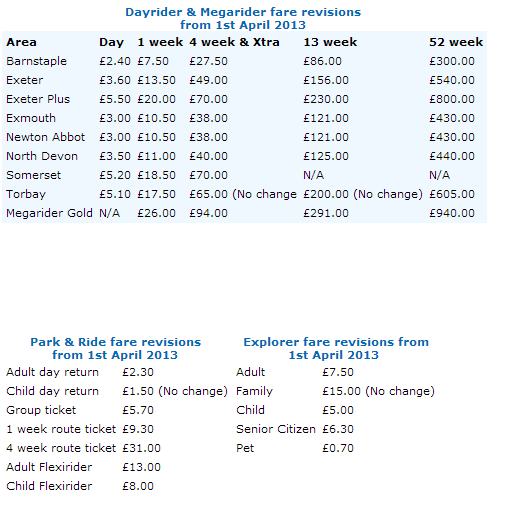 Below please find details of the price changes to our Dayrider, Megarider, Explorer and Park & Ride fares.